The tires shown in this picture are brand new and will deliver full traction even without the chains. Unfortunately even on pure ice, they will slip. That is when you should consider using tire chains for snow blowers on your tires to provide much better traction and avoid slippage. There are times when it make sense to use tire chains for snow blowers. Other times when you should not use them under any circumstances. Long driveways with slopes are examples when tire chains might be needed. You can waste a lot of time and become very frustrated trying to deal with icy snow conditions on an upward slope. You may even have to up hill without clearing any snow just to make it up the hill. Even going down hill in heavy snow with ice underneath may be a challenge. But when would you want to reconsider using tire chains? Any time you have a newly paved driveway that you do not want to scratch. Or paving stones that cost you thousands of dollars it is a time when you do not want to use tire chains. The chains will leave scratches that cannot be removed or hidden. Most people would not like this at all. In fact you should also use a Teflon scraper bar on the bottom. Also Teflon shoes for the snow blower to avoid any scratches on your pavement or paver stones. If you are planning to hire a professional snow clearing company to clear your driveway, this fact should be checked to make sure they use the right equipment on your newly paved driveway to avoid permanent damage. Tire chains for snow blowers craftsman or any make of snow blower will definitely help with traction control. The writer has personally used chains. From experience I can tell you there is a time to use chains on a snow blower tire. There is also a time when you definitely do not want to use them. Anyone with a brand new paved driveway or a driveway with stone pavers should really think twice about using the tire chains on their snow blower. The problem is that these chains will slip on the surface. They will scratch your brand new driveway leaving permanent marks. Asphalt can be resealed in the summer to hide the scratch marks to some degree. But they are there permanently. On stone pavers there is really not a lot you can do. Once the stones are scratched, the only way to get rid of the marks is to replace the stones. You might not even be able to replace them with the same shade. Now it will look worse than it did with the scratch marks on the stone. Just don’t use tire chains in these situations. If you have a steep driveway where traction is really important and you have to use chains, there is another approach you can try. On the way down the slope, the weight of the snow blower will help to carry it forward and you probably can cut a full swath on the way down the slope. On the way up you may have to settle for 1/3 or even less just to get up the slope without slipping. It is true that it will take much longer to clear your driveway, but that is the price of not using chains. If this approach does not work they you may just have to use the chains and live with the scratch marks. Never use Snowblower tire chains on a driveway that has interlocking stone installed on it. The tire chains on a snowblower, car or truck will scratch the driveway for sure. In addition if you are using a snow clearing service, make sure they use a Teflon blade. A teflon blade will avoid scratching the driveway. If your snow clearing company cannot provide this service, or will not talk about it, or worse gloss over it, then try another company. Once your driveway is damaged, the only way to correct the damage is to replace the stones on your driveway, which can be very expensive. Many companies offer this service at no extra cost however you will need to specify this in your contract. If you plan to clear your own snow from your driveway and have tire chains, remove them and only rely on the rubber tires. Although your snow blower may slip a bit it is much better than scratching your pavers with tire chains. In addition, Teflon skid shoes can be purchased for your snow blower. These skid shoes go on the bottom of the housing which comes in contact with your driveway. They will not mark your driveway and only cost a few dollars to purchase. Most people can install their own skid shoes. Consumers should also remember that snow plow operators do not want to have any problems with their customers and certainly not cause any damage that they would be responsible for. Make sure that your requirements are always clear and written down in the contract to ensure that both parties are clear about the requirements. This way there is no room for any misunderstandings. Also check in with neighbors or previous customers who have used this service in the past to confirm service levels and general satisfaction levels. 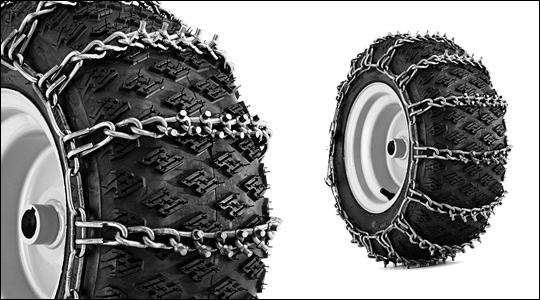 For more about using tire chains on your snow blower, click here. Our last post was about snow blower tire chains and we decided that we should also talk about garden tractor tire chains and why you might need them. When we talk about tire chains for a garden tractor, it is really because you plan to use the garden tractor in the winter time to clear snow. Some people will use a blade on the front of the garden tractor. While others will mount a snow blower attachment on the front or the back of the garden tractor. The more weight you can place on the drive wheels ( the back wheels) of the garden tractor the better the traction is going to be. Placing a blade on the front will not add any traction and it is not that heavy anyway. Adding a snow blower attachment to the front of the garden tractor will actually take a little weight off the back wheels. You will really need to consider tire chains for your garden tractor. Mounting the snow blower attachment on the back is probably the best from a traction perspective. However you will always have to be backing up when blowing snow. This means that you are always turned in your seat to make sure you are driving straight. 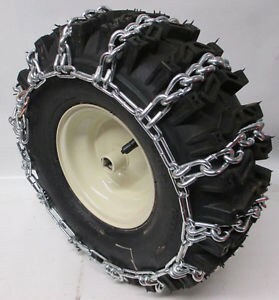 Either way , I think that if I had a garden tractor with a snow blower attachment on it, I would add tire chains to the wheels to gain that extra traction. A garden tractor is heavy. If you get it stuck you are not going to be able to manhandle it out of where ever it is stuck. All you will do is spin the wheels. This can happen sometimes even with tire chains on. But it will definitely occur when you do not have tire chains. Invest in tire chains and make sure they are on whenever you are blowing snow. Regardless of whether it is icy or not. Consider this situation. You are blowing snow with your garden tractor on a flat driveway that is covered with ice. You hit a particularly solid drift of snow. All your wheels are going to do is slip on the ice. They will not drive the garden tractor forward . Which is what you need if you are going to move that snow drift. The wheels will be spinning, but you will not be moving. With tire chains on the garden tractor wheels, the chains will dig into the ice and provide traction so that the entire unit will move forward. This is a simple straightforward situation. Consider what would happen in a situation where your driveway is sloped. The tires or going to slip on the ice and you might even move sideways as well, which can be dangerous if you go off the main driveway. Remember this is not something you can move yourself or even with the help of another person. If you get stuck in some way you are going to need the help of another vehicle to pull you out. You can still get stuck while using tire chains. The probability of this occurring will be a lot lees than if you do not have tire chains on the wheels. Most tire chains for garden tractors can be ordered from the dealer as an option. However the best time to buy them is when you are still negotiating the price of the garden tractor. Maybe you can get them thrown on as part of the deal. Let us know what you think about this post. Comments are welcome as long as they are well written and helpful to our readers. Well written comments will even be approved with a link back to your site. All other comments will be deleted since they do not help our readers nor do they help this site. So remember if you must leave a comment make sure it is on the subject of tire chains for garden tractors and helpful to our readers. My snow blower came with tire chains and I have to admit that I never have used them. In fact I don’t even know were they are at this moment. I might have used them a few times in the beginning, when it was really icy on our driveway, however now I just don’t bother. It is just too much trouble to get them on and off. My snow blower is about 24 years old and still going strong. Sure I have had to do a few repairs to it over the years. Rebuild the carb, replace a couple of bearings on the auger shaft, but that is about it. As far as snow blower tire chains are concerned I think the only time I would use them is if I was clearing snow on an icy slope. The thing that I have not missed are the snow blower tire chains that came with the machine. You would think that after all of these years, I would have had to use them. I have a large driveway and it has a slight slope to it. Most of the times there is compacted snow on it and the tires can grab onto this for traction. A few times there has been ice covering the driveway and the tires will slip a bit while pushing the snow blower forward. all you have to do is place the snow blower in a lower gear and take your tire. Sure the tires will slip here and there, but you will still move forward. If tire chains came with a new snow blower that I was buying, I would take them, but probably never use them. I would not ever pay extra money for the tire chains as an option after my experience over the past twenty or so years. this is the reason we are writing this post. Some people may be conned into buying tire chains for their snow blower and we want to save them the money. Now if I had a driveway with a steep slope or a sidewalk with a steep slope, I might feel differently. As I said our driveway is pretty flat and does not present much of a challenge other than it is long and wide. If it was sloped, it would be a different thing all together. Even with a little bit of ice, you might have a tough time getting up the driveway with your snow blower and then tire chains would definitely provide the grip you would need. It is important to make this evaluation and then decide based on the circumstances that you are dealing with. Also if you are clearing driveways in the neighborhood for money, I would have chains on my tires as well. You do not want to waste any time with the tires slipping on the ice. Tire chains will definitely make sure that you do not slip and slide. You might save 5 minutes on each driveway so this can add up over a number of driveways. If you are doing 10 driveways, that’s almost an hour you can save. Which is time you can use for more driveways or just control the time you spend outside in the cold. We do not need to have snow blower tire chains for our situation. We realize that there may be some situations that do require tire chains on snow blower’s wheels. That is why we discussed these situations in the preceding paragraphs. You may agree or disagree or have other opinions about when to use snow blower tire chains. Feel free to leave a comment on this blog. Any well written comment that is well written and about the subject of Snow Blower Tire chains will be accepted along with a link back to your site. We will not approve comments that are spam or comments that are just looking for a link with no supporting comments about our site.